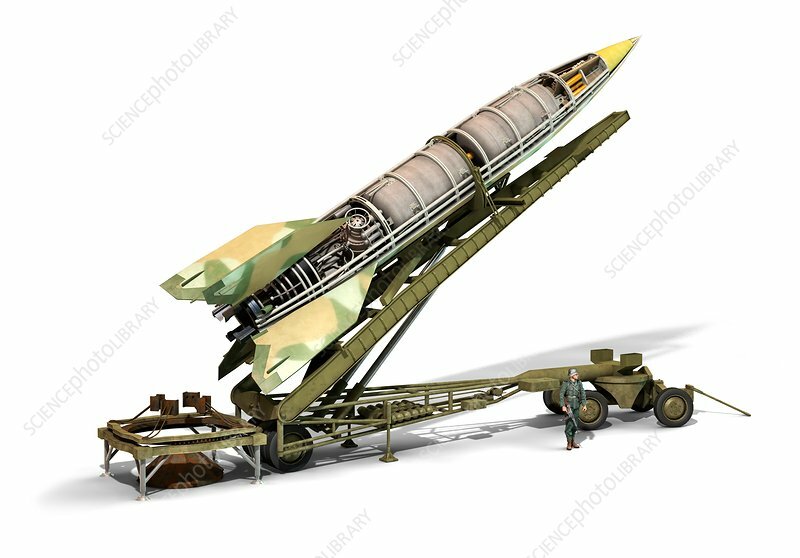 V-2 rocket missile and launcher, illustration. This rocket was designed and built at Peenemunde on Germany's Baltic coast during World War II. The rocket was 14 metres in length, carried nearly a tonne of explosive, and could reach a height of 80 kilometres. It was the world's first ballistic missile, and the first to achieve sub-orbital flight. The first successful flight was on 3 October 1942. From September 1944 to March 1945, over 3000 V-2 rockets were launched by Nazi Germany during the war. The work on the V-2 rocket laid the foundations for later work on space flight.